This letter was written by Isaac Cordon (1832-Aft1875) who served in Battery F, New York Light Infantry from May 1861 to June 1863. 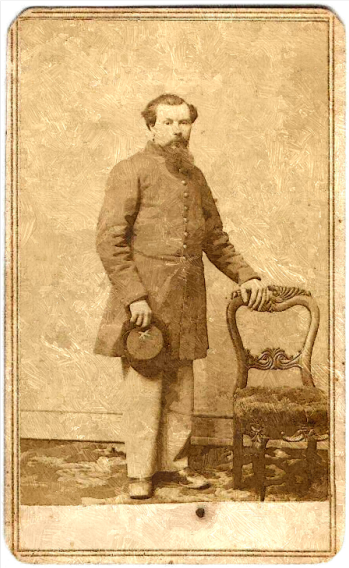 He subsequently re-enlisted in December 1863 in Company I, 9th New York Heavy Artillery and was with his regiment (fighting as infantrymen) at the Battle of Cold Harbor on 1 June 1864 when he was wounded severely in the left forearm. Cordon was sent to Cuyler hospital in Germantown, Pennsylvania, where he recuperated over the winter of 1864-65. He then served in the Veteran Reserve Corps until his discharge from the army. In the 1860 census, Cordon is enumerated as a 27 year-old, unmarried laborer — an immigrant from England — in Venice, Cayuga, New York. He married Mary J. Knapp (1843-Aft1888) in February 1864. After the war, Cordon resided in Genoa, Cayuga County, New York. He is enumerated there in June 1865 with his wife, Mary J. Cordon. In 1867 he is listed in the Cayuga County Directory as a farmer and a laborer at a cider mill in Genoa. After Isaac’s death, Mary must have remarried someone named Thompson as she filed a widow’s pension for Isaac’s service in 1888 from Nebraska. Just received your kind letter and I was glad to hear that you was well. Your letter found me in good health. I have sent you five dollars on the 20th and some postage stamps. It is nice pleasant weather here. Mary, you let them concerns alone and I will put them through for taking them letters out of the [post] office when I get home. I will show them if they have any right to take my letters out or not. I will put them where they can’t get to the office to get my letters. Mary, if you don’t get that five dollars, you must go to Northville and get some for I can’t send anymore for concern to get. Mary, I am sorry that you have got to leave the first of April but you must do the best that you can for there will be a time when I can be around again and it will come all right. I think that they didn’t take that green field soon enough and they ought to took him long before this time. I am glad that they have got him and I hope that they will keep him fast now [that] they have got him. Mary, you must write as soon as you get this and write whether you have heard anything more about them letters. Mary, you must send me all the news that you can and tell me what is a going on for I like to hear what they is a going on and what the folks is a doing. Write soon. This from your husband. To my wife Miss Mary. This entry was posted on Friday, October 31st, 2014 at 1:46 pm	and posted in Uncategorized. You can follow any responses to this entry through the RSS 2.0 feed.